Today I ate something that I never ever ate before. It was actually really yummy. Everyone else at my table except Spencer, my friend, thought it was gross. 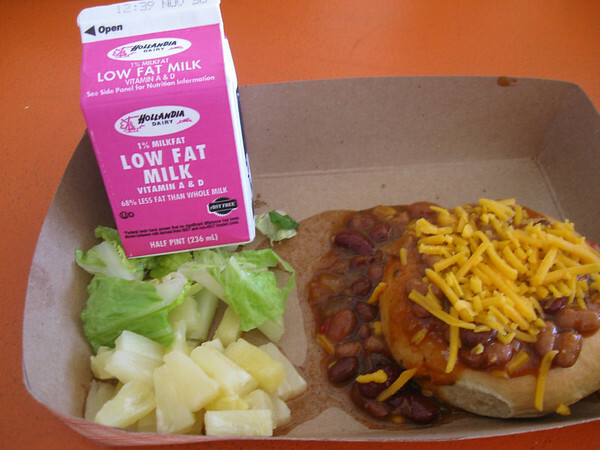 I had some chili and cheese in a bread bowl, salad and some canned pineapple. There was beans, corn, peppers and it wasn’t spicy. It was vegetarian. I ate it all. Next week is vacation and then I go back to the famous baba lunch, a sandwich made by my dad. From Ian in San Diego. Thanks for letting me send you letters. What did your friends think was gross? The bread bowl? Back in the Middle Ages bread bowls were common in Europe, including the British Isles so their ancestors probably used them! Glad to see that the food looks much better here! This time the chili looked quite good! Indeed bread bowls have been used for ages, that's a fine idea which even tastes good if it's well-made bread. But those cardboard boxes where everything is mushed together still give me a stomach ache. Why aren't real plates or at least trays with compartments for the different courses used, which are cleaned and re-used over and over again? This works great in my son's pre-school and school over here. Why shouldn't it work in San Diego, California, too? Much better today. It is a shame that they don't provide a smaller cardboard dish for the fruit, to keep it separate. It is better than styrofoam trays but quite unappealing. It's also a shame the fruit is not fresh, as tinned fruit will probably have extra refined sugar added to the syrup. And a few small lettuce leaves is hardly a veg portion. Good to see plain ss milk though. Love your blog, Veg, and the guest posts are fun!